July 5, 2013  The recent movie remake of The Great Gatsby hasn't opened in China yet. But the Chinese are no strangers to its themes of wealth, ambition and corruption. In fact, many Chinese argue that the excesses of America in the Roaring '20s mirror those in China today. June 28, 2013  China's economic growth has been fueled by bank loans that flow freely. 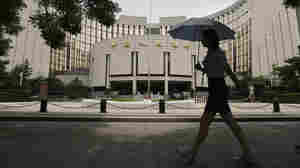 But during the latest bout of turmoil, China's central bank indicated that it may no longer lend so quickly and cheaply. The so-called shadow banking sector is of particular concern. June 28, 2013  Last week was a wild one for China's economy. Overnight borrowing rates spiked, lending between banks began to freeze up and the Shanghai stock market took a nose-dive. Things have calmed down since then, but the underlying problems that triggered the panic remain. Among them, the explosive growth of the country's so-called shadow banking sector. June 21, 2013  The lending rate between Chinese banks spiked dramatically on Thursday, creating a credit crunch. Renee Montagne talks to NPR Shanghai correspondent Frank Langfitt about the turbulence in China's banking system, and how authorities in Beijing are responding. June 18, 2013  China sees Edward Snowden, the former National Security Agency contractor who leaked details of the agency's surveillance programs, as the gift that keeps on giving. The country's state-run media has hailed him as a hero for exposing what it calls American hypocrisy. June 10, 2013  Edward Snowden, who says he revealed information about the National Security Agency's secret program to gather telephone and Internet data, has checked out of his Hong Kong hotel. He has suggested he will seek asylum in the semi-autonomous Chinese city, but many analysts believe the Chinese government won't grant him refuge, given its desire to improve Chinese-American relations. 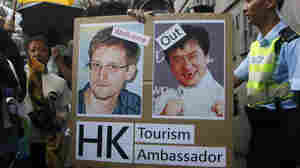 However, a problem with Hong Kong's asylum law might make it possible for Snowden to stay there for a while. June 10, 2013  The Guardian has identified its source for a series of reports it published in recent days on secret U.S. surveillance activity. The paper says the source is Edward Snowden, a former technical assistant for the CIA who now works for a private-sector defense and technology consulting firm. What Does China's Leader Want From The U.S.? June 6, 2013  Chinese President Xi Jinping says he wants to build a new great power relationship with the United States at this week's summit with President Obama. June 4, 2013  The Chinese government is trying to suppress any online discussion of the 1989 Tiananmen Square protests on their 24th anniversary. This has prompted some people to attempt to distribute photos reminding people of the event. 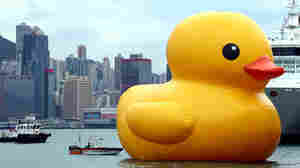 One image being censored refers to the iconic photo of a man standing before an advancing column of tanks, in the censored image, however, he stands before a column of rubber ducks. June 4, 2013  The beloved six-story, yellow rubber ducky that's been bobbing around in Hong Kong's Victoria Harbour has inspired companies to launch their own ducks in a number of mainland Chinese cities. 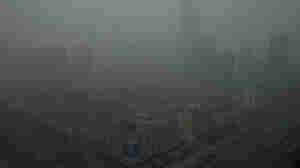 June 3, 2013  Fire and explosions ripped through a poultry plant in China Monday, claiming more than a hundred lives. 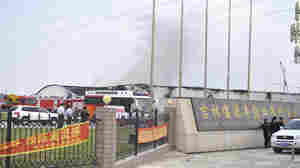 It was one of China's worst factory accidents in memory. Early reports indicate that blocked exits may have contributed to the death toll. June 3, 2013  A state-run newspaper reports that all but one of the doors at the processing plant in northeast Jilin province was locked when flames broke out. The fire is one of the country's deadliest industrial accidents in recent years. May 29, 2013  NPR's Shanghai correspondent Frank Langfitt worked in China in the 1990s when the bureaucracy was crippling. Back then, Westerners hired people to sit in line for hours to pay their bills. Now, you can waltz into convenience stores and take care of such tasks in minutes. May 29, 2013  The Communist Party's new leadership has pledged to change China's slowing economy by putting a greater emphasis on private enterprise and reining in huge but far less profitable state-owned businesses. Economists say the party has no choice but to update if it wants to stay in power, but they doubt that a genuine overhaul is in the works. China's Air Pollution: Is The Government Willing To Act? May 24, 2013  There is some political willingness, but because China is highly decentralized politically, the Communist Party has only limited influence over provincial governments and how they regulate their dirty factories. The powerful state-owned oil companies have also resisted pressure to produce cleaner-burning fuel.